Many wonder why the Vedic and Vaishnava cultures especially stress protection of the cow. The philosophical reason is simple: The cow is considered one of our mothers, as she gives us her milk and thus nutures our health and well being. 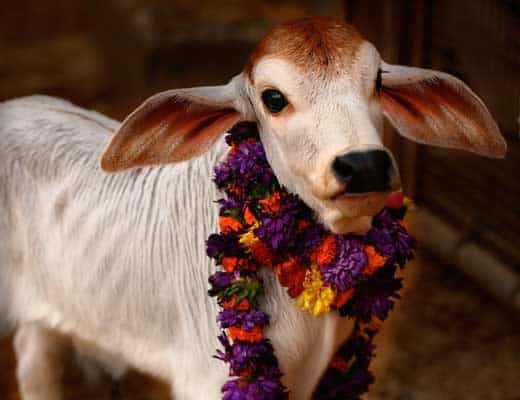 Just as no civilized person would injure or kill their mother, the Vedas teach that to take milk from the cow and then kill her is the same as killing one’s mother. Similarly, the bull is considered like the father because the bull traditionally helps in the tilling of the fields, and thus is to be respected. In ISKCON farms no cow, bull or calf is slaughtered. We look at innovative ways to work with the bull and engage their God-given strength in the service of others, under humane and loving conditions. Regardless of milk production, cows and bulls also produce dung and urine which is valuable as fertilizer, compost, some medicines, cleaning products and biogas fuel. In the ISKCON farms they are sheltered in barns (goshala), wherein they are fed with healthy stapple and are taken care of.